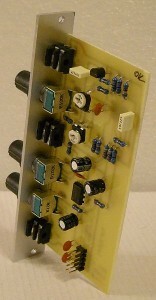 C-020 Voltage Controlled Distortion module for Eurorack / Doepfer A100. Set initial gain to just undistorted signal and CV (for example from EG) will increase distortion. Can smoothly distort input signal as CV increases. Old-fashion distortion type (no bzzzzzz) with its own character.